If you’re looking for costumes beginning with R then you’ve found the perfect page as we have a fantastic array of costume ideas for you. From a rabbit to Rambo, Rihanna to Romeo you really are spoiled for choice with this selection of costume ideas. I compiled this page along with a number of others as resource pages for anyone who’s been invited to an alphabet party. I used to get invited to a lot of alphabet parties when I was in my 20s and I think it’s high time they caught on again! In a nutshell you have to dress up as something beginning with a particular letter and if you’re on this webpage then the letter chosen is the letter R! I have other webpages available that cover the rest of the letters of the alphabet, but let’s look at costumes beginning with R right now. Rambo – One of Sylvester Stallone’s iconic 80s film characters, this Vietnam vet costume is easy to create by simply wearing a string vest, headband, camouflage trousers and some weapons as props! Red Foo – One half of the group LMFAO, Red Foo has also released singles on his own now as well and is a popular television personality. Red Riding Hood – Check out some of the selection of Red Riding Hood costumes to buy. Rick Grimes – One of the stars of the popular television shows The Walking Dead, Rick Grimes has fast become an icomic ‘R’ costme idea. Robin – Batman’s side kick, aka The Boy Wonder, Robin is a great costume idea that starts with the letter R.
The Costume Ideas Starting with the Letter R Continues! 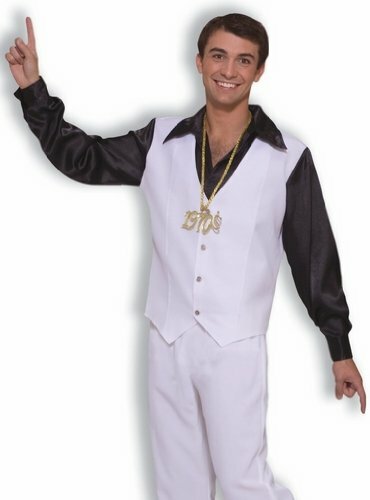 Rock and Roll Stars – This gives you the chance to break out your Elvis, Buddy Holly or Cliff Richard costumes to name a few. If you’re after costumes beginning with another letter of the alphabet then be sure to check out our A-Z of Costumes page for some great costume ideas. A Group Costume Idea – Perfect for Disco Divas! Abba were a supergroup made up of four people, two females and two males and they wore some great costumes which makes it easy to replicate for any fancy dress occasion. With songs like Waterloo and Dancing Queen the group embraced disco, including the jumpsuits that were the height of fashion during the 70s. Take a dance with me (or should that be ‘take a chance on me’?) 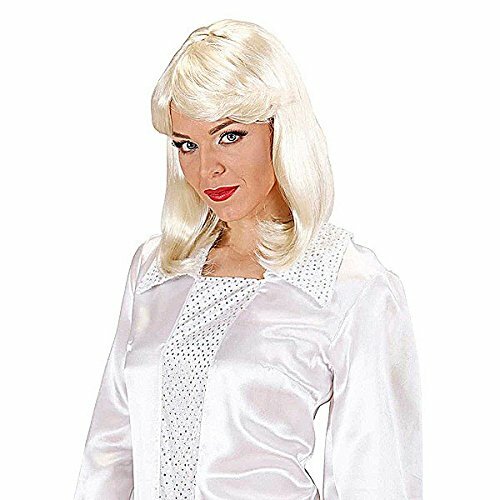 through these fun costume ideas and let’s see you and your friends dressed up in full Abba style whether it’s for an Abba tribute night, Halloween, a 70s party or just a cool fancy dress event. This outfit features the dress, sash and those boot tops. Of course if you don’t have blonde hair or can’t style it like Agnetha then you can always get this wig. 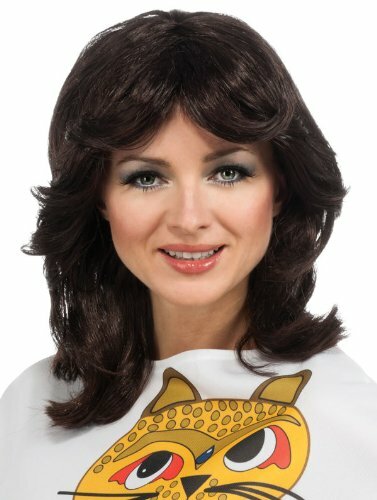 This wig will also work well with other Agnetha costumes. Of course if you’re after a wig for Frida I’ve found one here for you. This wig can be used for other Frida costumes, not just the ‘cat dress’ outfit. Now you couldn’t go as just the girls from Abba without their male counterparts (unless you were actually dressing as the two girls from Muriel’s Wedding performing Abba songs, but you need the jumpsuit outfits for those!). Here we have Benny ready to launch into Super Trooper! 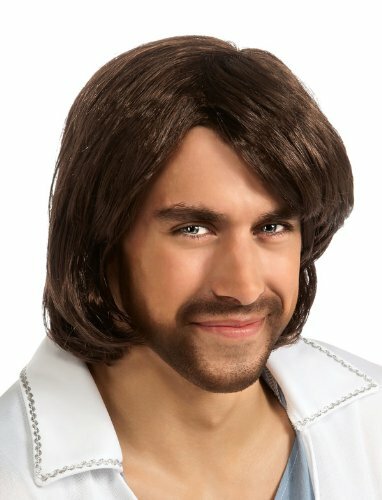 Unless your haircut is still stuck in the 70s you’ll probably need a wig to complete your transformation. Again whether you choose to wear the costume above or select a different look for Benny you’ll be able to don the wig. When I think of Abba I usually think about what the girls were wearing, but the men always tried to hold their end up as well. 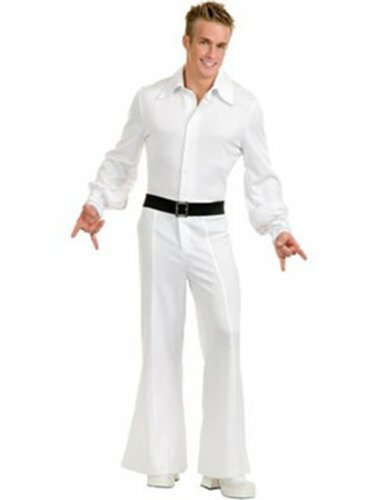 I usually think of them wearing white or silver whether it’s the disco jumpsuits or the ‘Saturday Night Fever’ style of suits. They did try and compliment the girls with what they wore, however, so if they were to wear the outfit pictured above then it would be when the girls were probably wearing the color red as a dress or jumpsuit. 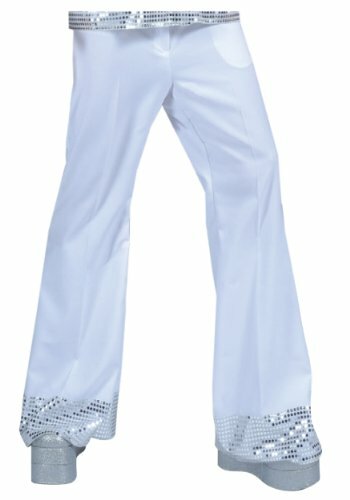 These white and silver sequined disco pants look perfect for either a Benny or Bjorn costume, unfortunately I can’t find a matching shirt to wear, but personally I would be looking for a silver sequined waist coat and use a different color shirt for Benny and Bjorn that matches the color of whatever the female members of this group will be wearing. Of course you could just wear any of the following outfits if you wanted as most people’s eyes will be on whatever the girls are wearing I’m afraid! Ditch the gold 1970s chain and add some platform shoes and you’ll be good to go. This one comes with a black belt, but you could wear it without a belt if the girls are wearing a white jumpsuit or with a different colored belt to compliment whatever the others are wearing. When it comes to Abba I always visualize the ‘girls’ wearing disco jumpsuits, it’s the first thing that pops into my head! I see them in a white jumpsuit doing that move where one is looking front while the other is looking to the side and then switch! Of course there have been a lot of other outfits over the years, but I’m going to give you a couple more jumpsuits to look at because let’s face it they’re a fun looking costume as well as being Abba-esque! Of course they didn’t always wear jumpsuits and what we think of as 70s disco wear. Their costumes were very innovative in looks however and their costume designer Owe Sandstrom is quick to confirm that the group all had input into what they were wearing. Both Agnetha and Frida had very strong opinions on what they wanted to wear while Benny and Bjorn were happy as long as they could match them! They wore unitards, jeans, mini skirts, long peasant skirts and a range of other outfits. You can check out some of their outfits here and draw on some inspiration for your Abba fancy dress outfit. Personally I like the zebra print dresses that the girls wore, but I can’t seem to find them online anywhere ….. I’m sure I’ve seen similar dresses in one of the teen shops in the mall though so you might be able to source them close to home. 80s Costumes are Cool Dude! If you’re looking for a cool costume idea for a man this year then why not check out the eighties for inspiration? There are so many cool 80s costume ideas for men that are absolute classics from Ghostbusters to his holy purpleness Prince, Billy Idol, MC Hammer and so many more. If you’ve never been to a toga party in your life then you may not have grown up in the 80s under the influence of movies such as Animal House and been introduced to Bluto, a very simple costume idea in itself. Let’s take a walk back in time to the 80s and catch up with the likes of Marty McFly, Adam Ant and ALF and get some truly bodacious costume ideas for you to try out this Halloween ……. in fact you might get so many ideas you decide to start throwing 80s parties and they’re never a bad idea! Awesome Costume Ideas for Eighties Dudes! There really are lots of ideas for and 80s costume that will suit a guy so if you really can’t think of one then just check out this list for ideas. I’ll discuss actual costume ideas further down the page and I’ll also be linking to costume ideas on this list to make it easier for you if you see the perfect idea for you. During the 80s there are two lovable aliens who instantly spring to my mind, the first was a regular to our television screens brought to us from the planet Melmac where his real name is Gordon Shumway. I’m talking, of course, about the big furry wiseguy who we called ALF (alien life form). The second is an alien that caused my best friend to cry when we watched him on the big screen and made us all want to phone home. This lovable alien also made a star out of a very young Drew Barrymore and is of course known to us all as ET. Either of these aliens would make a cool unisex costume. If you’re a single guy you should know that millions of girls around the world thought this guys really were ‘out of this world’ cute! 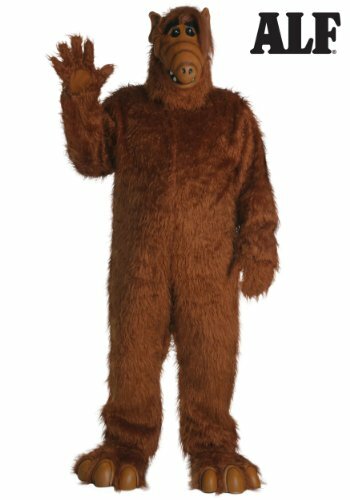 This ALF costume looks so cute I wouldn’t want to unleash it without first making sure that any cats are hidden away! I absolutely loved ALF and watched it religiously every Thursday night with the rest of the family, it was the night when we all watched tv and ate junk food for dinner – ALF, Sledgehammer (my father loved to say, ‘trust me, I know what I’m doing) and LA Law. This bodysuit certainly looks like it would be a warm costume which would make it ideal if you have to dress up in the winter. It looks very realistic, except the height of it and just seeing the image makes me feel very nostalgic indeed. Now I know a lot of people thought ET was cute, but look at his face, I’m sorry but he was pretty ugly! There was something utterly endearing about him though and as far as iconic characters of the 80s go he was right up there which makes him a perfect costume choice. I can’t find an ‘actual’ E.T. costume available at the moment, but this one is a costume of Elliott with E.T. in his bike basket which is pretty cool. 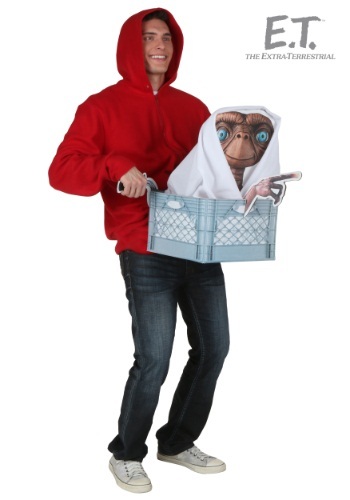 The costume includes a red zip-up style hoodie, the ‘bike basket’ with handlebars (this is actually made of cardboard), a cardboard E.T. bust with pointing finger that fits inside the basket and a white blanket to cover the bust. How do you encapsulate 10 years of diverse fashion into a few paragraphs to sum up what men were wearing? I can’t think of a more diverse time in men’s fashion that the 80s – the hair cuts alone varied enormously depending on your ‘clique’ as well as what year it was. We had the mullet, the perm, the rats tail, the rocker look, the assymmetrical look, the preppy look and so much more – why we even had a white guy wearing dreads in the shape of Boy George which was absolutely unheard of until the 80s hit. As far as clothing went you had acid wash jeans which was often worn with an acid wash denim jacket although as the decade progressed brown or grey leather jackets were worn with your jeans instead. Suits were big along with pastel colors – fathers around the world were disgusted to see their boys wearing ‘sissy pink’, it was so rebellious! Of course if you’re wearing pastel colors then that also meant combining the suit with boat shoes and (gasp) no socks! Thin, black leather ties were added to shirts and some people even owned piano key ties which were pretty cool! Sharks tooth pendants (I don’t think they were all sharks teeth as they were mainly brought at dodgy market stalls, but….) pendants were an important accessory to wear. I haven’t even touched on half of the fashions, but I hope it’s given you a few ideas on the diversity of men’s clothing during this tumultuous decade. Here’s a few ready made costume ideas for guys that you might like to look at getting, or just get inspiration from if you’re planning on making your own outfits. Fun, Cool & Just Plain Great Group Costume Ideas! If you want to dress up as a group for Halloween this year (or any other fancy dress event for that matter) then I’ve got some great ideas for you. There’s something really fun with having a group of you dressed as a group and it can make for a great night out for everyone. Inspiration for group costumes come from just about anywhere – musical groups, television shows, films even everyday life. The hardest thing is to get everyone to agree on the costume idea which is where I come in. I’ve compiled a list of group costume ideas that you can all look through and see if one of them stands out to you all as the perfect one. Abba – The 70s pop group were known for their costumes and if you feel like turning into ‘Dancing Queens’ for the night then this is a cool costume idea for a group of 4 (it should be 2 couples, but I’ve seen a few male Agnetha and Frida’s in my time and they’ve been quite funny!). Kiss – Crack out the face paint and the platform boots for this group costume idea, another great costume idea for a group of four. The Beatles – The fab four are another cool group costume idea and if there’s 8 of you you could try a ‘Beatles through the ages’ theme with their basin hair cuts and suits through to the longer haired Sergeant Pepper days. The Spice Girls – For five girls you know that you want to dress up as the Spice Girls, it’s what you ‘really, really want’! This is another fun group costume that is instantly recognizable. The Village People – This six piece group are one of the groups that several generations recognize straight way and are likely to start people singing earwig disco songs such as Macho Man and YMCA! Z Z Top – This Texan three piece group make another cool costume idea for a small group and you can see how to get the look below. This Texan trio are best known for the beards that two of their members sport – the third member has Beard as a surname so doesn’t actually need to have one! You actually have a lot of latitude with what you can wear to accompany these beards as ZZ Top have been around for quite a while and have been seen in a few different outfits over that time. The most well known look was probably the one that coincided with their album Eliminator hitting the mainstream charts for that look you want the two bearded members of the band to be wearing black suits with the non-bearded Mr Beard wearing black trousers with a long black duster coat. All three of them should be sporting hats similar in shape to the one featured in the image below along with some black sunglasses. Of course another look that their fans are very familiar with sees them in jeans and leather jackets along with either hats (again like the one pictured) or skull caps and their sunglasses. Personally I think as long as you all wear sunglasses and two of you sport these beards (and to really ‘sell’ it a couple of guitars – Frank Beard is the drummer so don’t have him with a guitar!) it won’t matter what else you wear everyone will know you’re ZZ Top. You’ll note that some of these contain links which will take you to another webpage that is dedicated to those particular costumes. I don’t have them all covered yet, but I’m hoping to be able to get links for all of these group costume ideas in time. You used to be able to purchase these Teletubbie costumes in a set of four which was really cool, but I’m having trouble sourcing a set at the moment so you have to purchase your favorite teletubbies seperately. The lovable green Teletubbie is Dipsy whereas the red Teletubbie is called Po. The yellow Teletubbie is called Laa Laa and rather surprisingly, considering that a lot of people just don’t suit the color yellow, this is the costume that I’ve seen more people wearing than any other Teletubbie outfit. Purple is my favorite color which means that out of all of these cuddly Teletubbies Tinky Winky here is the one I prefer! Awesome Idea for a Group Costume! Dressed up as Spartan Warriors you can all say you’re extras from the movie 300! The movie was based on 300 Spartans who stood up against an army of 100,000+. Alice in Wonderland Characters – Someone obviously has to be Alice and then it’s simply a case of choosing the best known characters until everyone in your group has a costume. The bigger the group the more less known the characters that will add to the ‘ensemble’. Angry Birds – You can get all of the different Angry Birds characters in costume so it’s just a case of everyone choosing their favorites. Batman, Robin & all the Villains – Make sure that you have Batman and Robin covered and maybe even Alfred and then simply add the villains until everyone in your group is covered – there’s certainly plenty of villains to choose from including the Penguin, the Joker, Poison Ivy etc. Don’t forget the Suicide Squad! Another great group costume idea. Crayons – You can get some great Crayola costumes (although these are designed for ladies) in various colors so if you all chose a different color you can say you’re a box of crayons, but you lost your box! Guess Who ‘People’ – This is a costume that I’ve seen images of and is definitely in the diy Halloween costume column. If you need instructions check out Homemade Guess Who Characters. Hip Hop Dance Crew – Whether you go with a Jabbawockeez Halloween costume, Remix Monkeys or a dance crew from any of the popular dance themed movies. M & Ms – You can actually buy sets of group M&M costumes or you could just buy/make the costumes yourselfs, just make sure you’re all different colors, the room won’t be big enough for two Reds for example! Monster High Pupils – If you’re after this costume ideas for a group of young girls you can check out – MHS Costumes for Girls. Oompa Loompas – From Willy Wonka’s Chocolate Factory the Oompa Loompas make a fun costume and I’ve even seen a group of people dressed up as them at an international rugby match in recent years – they certainly stand out on camera! Pac Man – You can buy a set of group costumes (see below for one example) for this idea yourself – they’re available for sets of 5 or 6 and feature Pac Man himself along with the ghosts. Tetris Blocks – This is a very cool costume ideas that is easy to make at home as it simply requires lots of cardboard boxes, paint and black electrical tape. There are lots of pages that show you how to make them online, here’s one of them – The Diary of Tetris. The Tudors – You can dress as a group of Tudor peasants or a group of Tudor aristocrats for a fun costume idea. If you wanted to you could also dress as famous Tudor people whether it’s Henry VIII and all six of his wives or all of the Tudor monarchs together is up to you! The Wiggles – a pair of black trousers and different colored skivvies are all you need to be The Wiggles and if there’s more than four of you in the group then you can get one of you to dress up as Captain Feathersword, another as Dorothy the Dinosaur and just keep working through these favorite children’s characters until your group are all in fancy dress……..watch out though if you’re too good you might get booked for a child’s birthday party! This is a classic group costume idea for six people. Featuring Pac Man himself along with the four ghosts and one ghost that’s ready to be eaten! The great thing about this costume idea is that all of the costumes are unisex so it really doesn’t matter what the make up of your group is – all male, all female or a mixed bunch. Dress Like an Eighties Girl! Looking for some 80s costume ideas for women? You’ve come to the right place if you want to take a trip back in time to the decade that rocked! If you love the 80s then you might want to throw an eighties party so that you can nostalgically dress in some of the cool 80s fashions, then again you could just go back to the 80s for Halloween this year. Whatever reason you have for wanting to dress up in cool, retro fashion I promise to give you lots of cool costume ideas to choose from. Create your own 80s outfit, dress like you did way back then or pretend to be an 1980s star – the options are all yours. Make sure you have plenty of extra strong hold hairspray because we need big hair to go with these outfits – what are you waiting for we’re going back to the 80s man and there’s just no stopping us! The Most Bodacious Costume Ideas Ever! There are lots of great costume ideas for women, you can make your own or buy ready made costumes the choice is yours, but what exactly do you want to dress up as? I’m going to start with a big list of all of the 80s costume ideas I can think of and then we’ll go into more detail on a few of them further down the page. If you see one that takes you fancy and it’s a link then click on the link to go to that part of the page (or another webpage) for more details. The Goth subculture was born in the 80s which is why the Gothic look associated with this decade is often referred to as Traditional Goth (or 80s Goth). The 80s embraced bands such as The Cure and All About Eve which seemed to embrace the darker side of life. One of the things that you think about when you think of Goth is black clothing although it was really about irony as well – wearing an old white wedding dress with big Gothic hair was seen (and photographed for Sunday paper excerpts) around cities in the UK etc. If you’re thinking of creating an 80s Goth costume though I think you should go with the black look that everyone is familiar with. If you don’t have black hair consider dying it and then back-combing to get a lot of volume, alternatively you could try one of these wigs. This black shag hair do works really well in a Gothic look, it would also work for a punk or rock look too. The good thing about this particular wig is that it suits for either a male of female costume so if your partner is dressing up in an 80s Goth fashion as well you could get two of them! 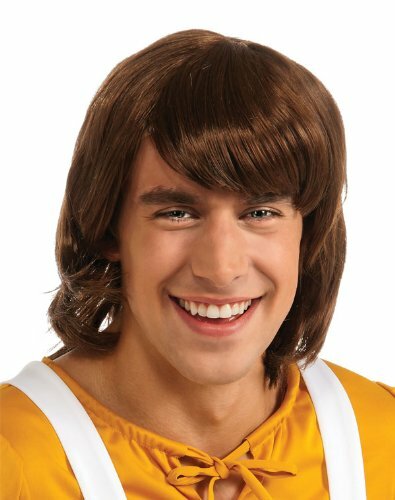 If you prefer a longer hair style then you could try the next wig. Personally I would backcomb this wig a bit to get more volume (I much prefer the one above for a costume idea). Of course it’s not just about the hair when it comes to creating an 80s Goth costume is it? You also need to get the make up right, the first thing I think of is the heavy black eyeliner, black eye shadow, pale skin and the choice of bright red or black lipstick (although I’ve seen some costumes where people have worn purple and have pulled it off very well). Don’t forget the black nail polish. Back in the 80s it wasn’t as commonly used as it is these days and was really mainly Goths that wore black on their nails. Next up we have to think of what to wear and a long black skirt is the way to go, you can use a black maxi skirt which would look really good. What would be even better is if you could find a black 80s petticoat skirt – these skirts had a ragged looking edge to them which was just perfect. Over the skirt you’ll need to wear an over-sized black t-shirt and to this you can add a studded belt if you like and finish off with a leather jacket if you have one although it’s not really important that you have that, some Goths just wore long black coats, especially in winter. But what about footwear for a Goth? Doc Martens are a classic 80s Goth boot – you basically want a pair of boots that say – don’t mess with me – and Doc Martens say that best! A lady Goth could get away with wearing a Victorian style heeled boot however, although I tended to prefer Doc Marten rip-offs when I was going through my Goth stage, but that was just because I was a broke teen and couldn’t afford genuine DMs. Two 80s classic dance movies were Flashdance and Fame and between then they introduced legwarmers to the 80s fashion scene! Not only did we have the two movies mentioned above, but one of them – Fame – spawned a popular television show which meant that dance wear and fashion melded together. Add the aerobic fitness craze that caught peoples attention during this decade, thanks in part to Jane Fonda’s fitness videos and everyone was ‘Getting Physical’, not just Olivia Newton John! So how can you pull together a dance or fitness inspired 80s costume? You first step for this costume is to get a high cut leotard. You wear this leotard over the top of either leggings or bike pants with either a pair of slouch socks or (preferably) leg warmers and some sneakers. Next you’ll want to wear a thin belt around your waist (you want to be sure everyone notices your waistline, your sweaty aerobics classes aren’t being taken for fun you know!). An optional idea is to wear an 80s string vest over the top of your leotard, either black if you’re wearing bright colors or if you have fairly muted colors then make sure the vest is a neon color (neon pink is particularly nice over grey or black workout clothes). Alternatively you can wear an off the shoulder t-shirt over your leotard. You can source these shirts in a number of high street shops these days or else you can take a pair of scissors to a t-shirt that you already own. Here’s a tutorial on transforming one of your existing t-shirts into an off the shoulder cute top – DIY Off the Shoulder Shirt. Now you need to add sweatband to your wrists and you’re nearly ready. As far as make up is concerned I would just add clear (or very pale pink) lip gloss, but a little blue mascara is a nice touch if you want to add more than just lip gloss. If you have long hair then the easiest way to wear it is in a simple, high ponytail. If you have shorter hair then try and lift it abit (google 80s hairstyles for ideas), next (and very importantly) you’ll need to add a headband! Both the power pellet style of costume featured above and the lady’s pinky costume are available in all of the ‘ghosts’ namely Inky, Blinky, Pinky and Clyde as well as the power pellet. You can make a group costume up with your friends including Pacman himself along with all four ‘ghosts’ and if you have a sixth person a power pellet as well. Another fun and iconic 80s game is the rubiks cube, I say game, but for many it was a source of extreme frustration! It is a quickly recognized icon of the eighties however which makes it a great costume idea. You can buy this costume here or make your very own costume, all you need is a big box, paint and black electrical tape. 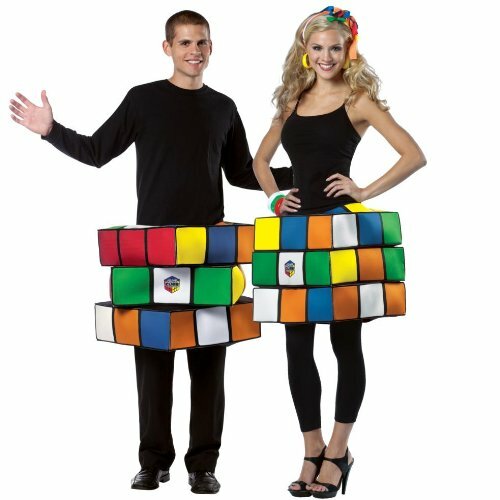 It’s been a few years since I made a Rubiks Cube costume, but I do remember that I had forgotten I would need to go to the toilet much to my friend’s amusement! Now how you wear this will depend on the size of the box you get – if you get a big enough one you could have the top resting on your shoulder, otherwise you’ll need to use braces to keep it in place around the middle of your body. I cut out the bottom of the box so that I could walk properly, I also cut a good size hole in the top so that I could fit it over my head, but not too big so that it could sit on my shoulders – obviously if you’re wearing yours lower you’ll have to see if your shoulders or hips are the smallest and cut a hole to accommodate them. I also had arm holes cut out of two sides of the box, but if you’re using braces to keep the cube around your middle you won’t need these. Now paint each side of your box a different color, using the colors of the rubiks cube – red, orange, yellow, blue, white and green. Now you need to use the black electrical tape to transform these solid colored sides into nine smaller squares. Wear black leggings and a black t-shirt underneath the box. There are so many different ideas for costumes I just had to add these fun ideas to the page for you to look at as well.